Morphogenius is an application for tablet that was proposed for the exhibition on Leonardo Da Vinci at Cité des Sciences, Paris. It is inspired by Leonardo Da Vinci morphological drawings. 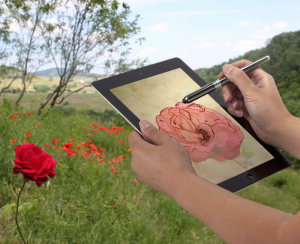 It allows to “transfer” reality as captured by the tablet’s camera into 3d drawings. The camera stream is processed with an edge detection algorithm easing the readability of shapes and structures. All drawings are done in 3d and the user can move, rotate and zoom them in any direction.